Amazingly, the site contains an archive of every issue of Girls’ Angle Bulletin, a wonderful bimonthly journal to “foster and nurture girls’ interest in mathematics.” In their most recent issue, you’ll find an interview with mathematician Karen E. Smith, along with several articles and puzzles about balance points of shapes. There’s so much to dig into at Girls’ Angle! In addition to the Bulletins, there are two pages of mathematical videos. The first page shares a host of videos of women in mathematics sharing a piece of math that excited them when they were young. The most recent one is by Bridget Tenner, who shares about Pick’s Theorem. The second page includes several videos produced by Girls’ Angle, including this one called “Summer Vacation”. What is that?! It certainly is a tiling, and all the tiles are the “same”—even if they are different sizes. Neat! Clicking on the image, I found myself transported to a page all about spiral tilings at the Geometry Junkyard. The site is a whole heap of geometrical odds and ends—and a place that I’ve stumbled across many times over the years. Here are a few places to get started. I’m sure you’ll enjoy poking around the site to find some favorite “junk” of your own. Last up this week, you may have seen this coin puzzle before. Can you make the triangle point downwards by moving just three pennies? There are lots of variants of this puzzle. You can find some in an online puzzle game called Coins. In the game you have to make arrangements of coins, but the twist is that you can only move a coin to a spot where would it touch at least two other coins. I’m enjoying playing Coins—give it a try! I solved this Coins puzzle in four moves. Can you? Can you do better? That’s it for this week’s Math Munch. Bon appetit! Welcome to this week’s Math Munch! It’s a week of mathematical games, including a devilish little game and variations on the theme. First up, check out this simple little game called 2048. Really, you must go try that game before reading on. The first time I played, I thought randomly moving the pieces around would work as well as anything, but wow was I wrong. Give it a try and see how far you get. Now watch how this AI (artificial intelligence) computer program plays 2048. You’ll probably notice some patterns that will help you play on your own. A beautiful chain of powers of two. Can you solve from here? Did you notice that the smallest tiles are 2’s, and you can only combine matching tiles to create their double? This makes all of the tile values powers of two! (e.g. 2048=2^11) These are the place values for the binary number system! (Did you see our recent post binary?) This has something to do with the long chains that are so useful in solving the game. It’s just like this moment in the marble calculator video. 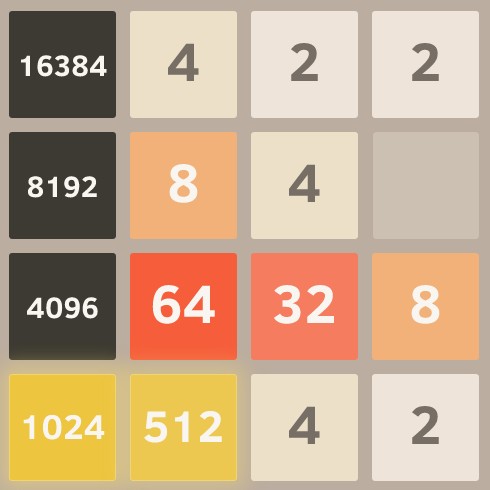 If you’re finding 2048 a bit too hard, here’s an easier version. It’s called 4. It’s a little silly, but it’s also quite interesting. After you make the 4 tile (tying the world record for fewest moves), click “keep going” and see how far you can get. I’ve never been able to get past the 16 tile. Can anyone make the 32? What’s the largest possible tile that can be made in the original 2048 game? Amazingly, someone actually made a 16384 tile!!! Silly versions aside, there are lots and lots of ways you could alter 2048 to make an interesting game. I wondered about a version where three tiles combined instead of two, but I couldn’t quite figure out how it would work. Can you? (See below.) When I thought about different types of numbers that could combine, I thought of the perfect thing. The Fibonacci numbers!!! 1, 1, 2, 3, 5, 8, 13, 21, … The great thing is that someone else had the same idea, and the game already exists! Take some time now to play 2584, the Fibonacci version of 2048. 2048 and 2584 might seem like very similar games at first, (they’re only 536 apart), but there are some really sneaky and important differences. In the Fibonacci version, a tile doesn’t combine with itself. It has two different kinds of tiles it can match with. I think this makes the game a little easier, but the website says 2584 is more difficult than the original. What do you think? Here’s a tough little 3D version. But I actually prefer this tight 2x2x2x2, 4D version. Here’s a clever little spin. Combine fractions to add up to 1. If you need more room, try playing 2147483648. Someone figured out how to do the three tile version. Check out 243. Many more on this big long list of variations. I hope you dig into some of these games this week. Really think and analyze. If you come up with clever strategies or methods to solve these puzzles, please let us know in the comments. Have a great week, and bon appetit!